The solution — if there is one — lies not in asking, “What do newspapers (or local TV news programs, etc.) look like in the 21st Century?” The solution lies in asking, “What does a news organization (local, national, international) look like in the 21 Century?” The latter is question is not predisposed to a particular media solution. There is a threshold to today’s productivity found at the very point where progress with people is supplanted by progress. Often, it’s the sheer speed of communication that affects our judgement. Because we believe others expect immediate responses, as we do ourselves, we often don’t take the time to craft meaningful responses. The apps plug into your existing Facebook Page and will cost between $20–$500 per month based on the number of Likes on your page. Plus, there is an analytics dashboard to provide you with the data from all the new interactions you’ll be generating. Take the apps for a spin for 30 days at no cost. Just heard ad for service that helps you “connect to a work computer from your kid’s soccer game.” Ignoring family is now a product benefit. Technology is like The Force. There is a Dark Side and its seduction is subtle. Succumbing to The Dark Side of Technology is easily justified for dozens of seemingly good reasons. 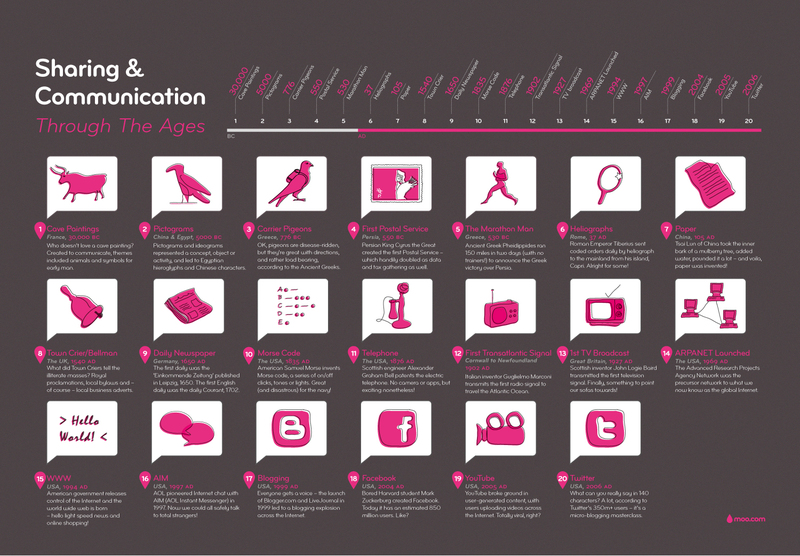 From cave paintings to Twitter, communication has come a long way in the last 32,000 years or so. Now, thanks to Moo, you just can read the Cliff’s Notes. It’s like high school all over again.